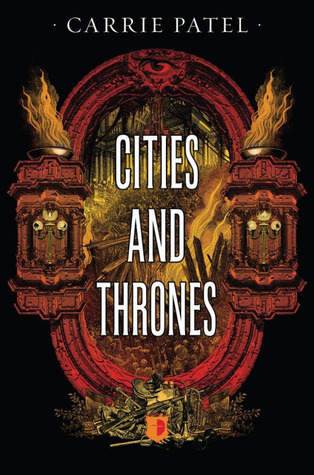 Continuing smoothly from the first book in the series, Cities and Thrones is an intelligent, beautifully written, and well crafted story of dystopian/post apocalyptic intrigue. Where the first book surprised with its “Planet of the Apes” ending, the second book feels very much like a study of the after affects of the French Revolution. Political maneuverings, shady dealings, rise and fall to/from power, and a scramble to understand, survive, or capitalize on the upheaval are the core of the book. Story: Both Jane the laundress and Malone the police chief will have to find their place in a new city order. Recoletta has fallen to Sato and one woman will have fled while the other is holding her new position precariously. For Malone, she now heads the police department and reports directly to Sato. Jane and Frederik have fled to a neighboring City and must find jobs. Between the two, Arnault plays a very precarious and very dangerous game. In this world, knowledge is power and what Jane and Malone do with the knowledge they gain will determine who lives, who dies, and who comes out on top of the new Recoletta. The City of Recoletta was a character in itself in Carrie Patel’s first book, The Buried Life. With Cities and Thrones, we’re given a second city, Madina, and the world building is just as intricate. Where Recoletta felt very much like a location from Les Miserable (gestalt rather than plot), with Jane’s Madina we’re given a more middle Eastern feel that quite intrigues. Along with the two major cities, players from the communes above ground (who provide the food for the cities) also play a huge part in the politics. What I really loved (and respected) about Cities and Thrones is that Patel doesn’t pander to the reader, overwrite the story, or otherwise tell rather than show. Yet the wording isn’t dense, frustrating, or nebulous. Reading is smooth and consequences often explained through character’s POV (which makes sure readers don’t get lost in the politicking but also helps keep the perspective intact). Jane had been a frustrating creature for most of the first book and in this second book, she begins to come into her own. No, she won’t suddenly be given super powers; she’ll fail to see the big game as well. But she’s not as much the victim any more, which is an improvement. Malone, meanwhile, loses a lot of the confidence of the first book and spends a lot of Cities and Thrones treading water. The strength is still there – and she will make key decisions – but it isn’t until the end that we get to see the depth of her strength of character again. The structures of books 1 and 2 parall each other – a testament to Patel’s writing skills. This is clearly a series that has been carefully plotted in advance and won’t fall apart by the end. The surprises were many and once again we have a very strong and definitive ending that does not end on a cliffhanger. The writing of these two books is especially tight and rewarding to readers. I’ve greatly enjoyed the Recelotta series and look forward to book 3. Reviewed from an advance reader copy provided by the publisher. This entry was posted in ARC, dystopian and tagged america, les miserables, library of congress. Bookmark the permalink.